Eileen Lyons is a fourth generation painter. 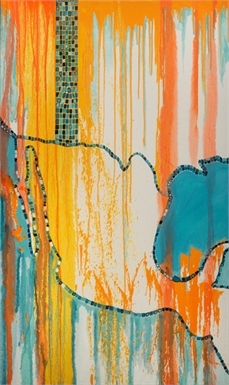 She has lived and worked in the Washington, DC metropolitan area as an artist and arts educator for more than 20 years. In her current work, Lyons is focused on the concept of place. She is investigating urban and tropical human-built landscapes. Using boundaries and walls as visual metaphors for the building up and tearing down of personal relationships, the formal elements mirror the psychological undercurrents. Mapping serves as a means of organization and metaphor for navigation. Incorporating elements of chance,color and patterning are used to explore the tension between chaos, rigidity and the interstitial spaces between. Lyons is represented in many private collections. She has a BFA from St.Mary's College of Notre Dame and a MA from American University. She studied master level painting and drawing at the Corcoran College of Art + Design for many years. Lyons received her certification in secondary education from the University of Virginia and has taught highschool studio art for many years. Currently, Lyons is teaching studio art at Edmund Burke School in NorthWest, DC.